Bio Notes: George Frederick Bodley was born in Brighton on 14 March 1827, the son of a doctor who practised in Hull. He was the first pupil of Sir George Gilbert Scott (1811-1878) from 1845 for five years, thereafter remaining with Scott as assistant until 1856, when he commenced independent practice. He travelled in Italy, Germany and France. Bodley went into patrnership with Thomas Garner from 1869 until 1897; the practice was continued by Cecil Greenwood Hare (1875-1932). Bodley was superintendent architect of York Minster and Peterborough and Southwark Cathedrals and he had an international practice, designing the cathedral at Hobart, Tasmania and the National Cathedral, New York with his former assistant Henry Vaughan of Boston. He was awarded the Royal Gold Medal in 1899, the same year he was elected Fellow of the RIBA on 29 May, being proposed by Council. Bodley was elected ARA in 1882 and RA in 1899. 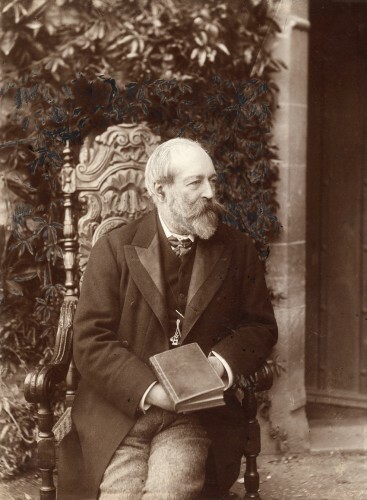 Bodley died at Water Eaton on 21 October 1907. Christ Church (Episcopal), churchyard, Sir James Miller Memorial Cross Duns Berwickshire Scotland Because the date is unknown, it is unclear whether Garner was involved as well. 1857 St Salvadors Episcopal Church and Hall Dundee Scotland First church - with lower floor containing classroom and upper floor temporary church. Now Maxwelltown Information Centre.